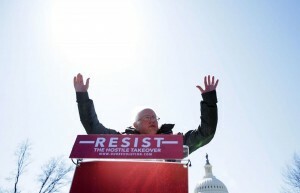 Sen. Bernie Sanders (I-Vt.) announced a plan Wednesday that he says will lift the nation’s lagging wages by restoring power to unions and protecting workers in the gig economy — both top items on the labor movement’s wish list. The Workplace Democracy Act, co-sponsored by Sens. Kirsten Gillibrand (N.Y.), Kamala Harris (D-Calif.), Elizabeth Warren (D-Mass.) and 10 other Democrats, would make it easier for workers to organize, supporters say. The bill would allow employees to form a union by a majority sign-up process, rather than an election (which proponents say heightens the risk of employer meddling); require companies to negotiate with a new union within 10 days of receiving a request; mandate that workers in every state pay some dues to unions that represent them; and expand the law’s definition of “employer,” a hotly debated term as the country’s contractor workforce expands.